Looking for a unique way to celebrate a special occasion or honor an individual? Set up a page that allows others to donate one-of-a-kind gifts on your behalf! 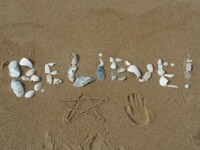 Use our fundraising tool to create your very own online fundraising page for Believe In Tomorrow. You can customize your page with pictures and details about why you’re helping critically ill children and families believe in tomorrow! How did the Online Fundraising Program start? 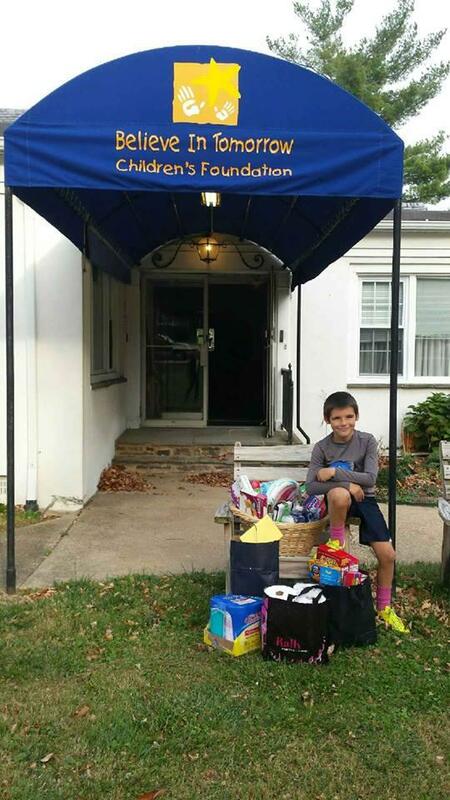 Learn how one 10-year-old boy put others before himself on his birthday! Matching Gifts: It’s easy to double your donation to Believe In Tomorrow if your company participates in a matching gift program. 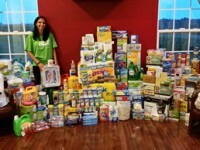 Many companies will match your charitable donation dollar for dollar. Simply fill out and include a matching gift form when sending your donation. Check with your employer to see how you can maximize your gift! Workplace Giving: Believe In Tomorrow participates in the world’s largest and most successful workplace giving campaign, the Combined Federal Campaign (CFC). Through the CFC, as well as many state and local campaigns, government workers support the work of Believe In Tomorrow through payroll deductions. Pledges made during the annual campaign season go directly to Believe In Tomorrow’s programs for critically ill children and their families. If you are a federal government or military employee, please use the following codes to choose us as your charity of choice through the CFC. If you participate in Workplace Giving through United Way, you can designate us as your charity of choice by writing in “Believe In Tomorrow Children’s Foundation” or “The Believe In Tomorrow Children’s House at Johns Hopkins” when completing your campaign form. Each of Believe In Tomorrow’s hospital and respite houses are built, renovated, and maintained through donated construction materials and labor. 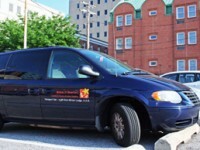 We also rely on in-kind donations of specialized services and modern furnishings to keep our houses comfortable and inviting for families. 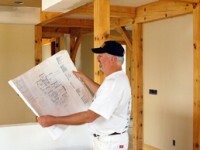 Help build new homes and maintain current ones by lending your expertise, services, or materials (appliances, fixtures, flooring/carpeting, etc.) that keep our properties looking brand new for our families. In the near future, we plan to expand our mountain respite program by building a second log cabin home in Western Maryland near Deep Creek Lake. We are seeking key donated services to help start building another mountain getaway for our families. If your business is interested in getting involved, please reach out using the contact information at the top or bottom of this page. 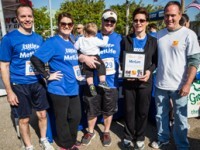 By including Believe In Tomorrow in your long-term financial planning, you are leaving a legacy for you and your family, and a myriad of opportunities for a children with cancer and other life-threatening illnesses. There are many types of planned gifts such as leaving money or assets in an estate plan or will, charitable lead trusts, charitable gift annuities, charitable remainder trusts, and non-cash assets. Talk with your financial advisor today about your planned giving, knowing that your future donations will help critically ill children and their families for years to come. For many of our fundraising events and building/renovation projects, we seek corporate sponsors to lend much-needed monetary support from beginning to end. We know that partnering with reliable charitable organizations is important to companies large and small, and we seek to offer a variety of mutually beneficial opportunities for you to join our team. 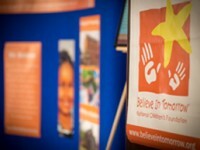 Contact our events team today at events@believeintomorrow.org to learn what opportunities are available at this time. Host a fundraising event to lend additional support and spread more awareness about Believe In Tomorrow’s programs. The donations you raise, both large and small, can make a huge impact on the lives of critically ill children and their families. We’d love to help you put together a successful fundraiser using our new online fundraising tool! To learn more and submit your idea, please contact our events team today at events@believeintomorrow.org. 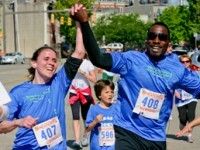 Participating in an upcoming running, biking, swimming, or other competitive event and want to do it for a good cause? Race for Believe In Tomorrow! We’d be more than happy to set you up with an online fundraising page to collect donations and reach a fundraising goal. All our athlete fundraisers are important to us, and we’d love to send you some swag to represent Believe In Tomorrow while you train and participate in your event. Contact our events team today at events@believeintomorrow.org. We can set you up with an online fundraising page and send you some gear to represent Believe In Tomorrow during your event. 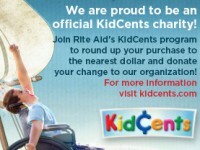 As an official KidCents charity through the Rite Aid Foundation, Believe In Tomorrow can be the recipient of your spare change each time you shop at Rite Aid. Register online as a Rite Aid Wellness+ Member (it’s free!) and choose Believe In Tomorrow as your charity of choice. Each time you shop at Rite Aid, you can round up your change to benefit Believe In Tomorrow! Click here to register as a Rite Aid Wellness+ Member, or to log in to your existing account and designate Believe In Tomorrow as your charity of choice. Whenever you shop online at Amazon, a portion of your purchase can go to Believe In Tomorrow through the Amazon Smile program. 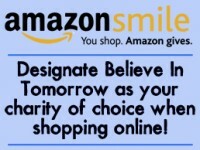 Go to smile.amazon.com and select Believe In Tomorrow as your charity of choice. Whenever you shop, 0.5% of your eligible Amazon Smile purchases will go directly toward funding Believe In Tomorrow’s programs for critically ill children and their families! Help us spread the word by letting friends and families know to choose Believe In Tomorrow as their charity of choice when shopping on Amazon.